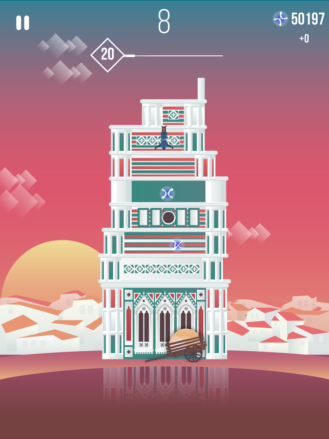 Ketchapp has taken their popular casual tower building game The Tower and has slightly tweaked it for Assassin's Creed's 10th anniversary with the release of an all-new yet familiar title. 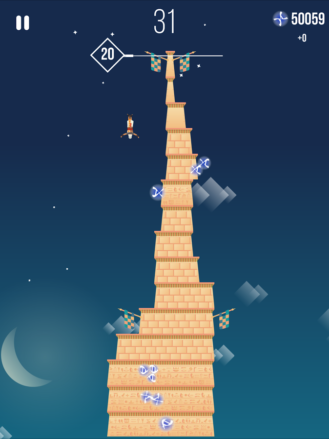 This new game is known simply as The Tower Assassin's Creed, and you can expect all of the same tower building goodness of the original with the added benefit of having an Assasin's Creed character jumping off of these towers. In a way, combining The Tower with Assassin's Creed makes a lot of sense. The Assassin's Creed series is known for its tower jumping gameplay where you can jump from just about any height as long as you land safely in a cart filled with hay. 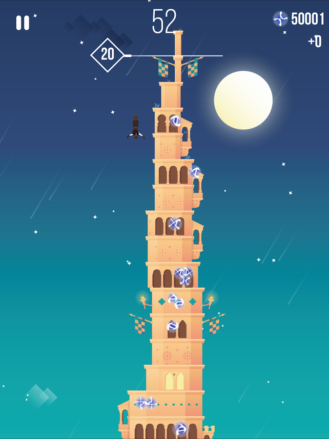 And once you take a quick look at Ketchapp's original release of The Tower, you can see how easy it would be to add in a simple tower jumping mechanic, which is precisely what Ketchapp has done here. 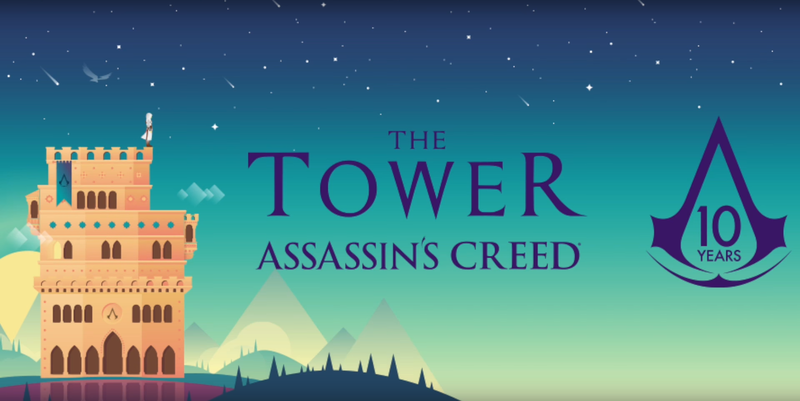 Basically The Tower Assassin's Creed contains all of the same tower building gameplay found in The Tower, but with a slight tweak where there is an Assassin's Creed character climbing this tower as you build it. 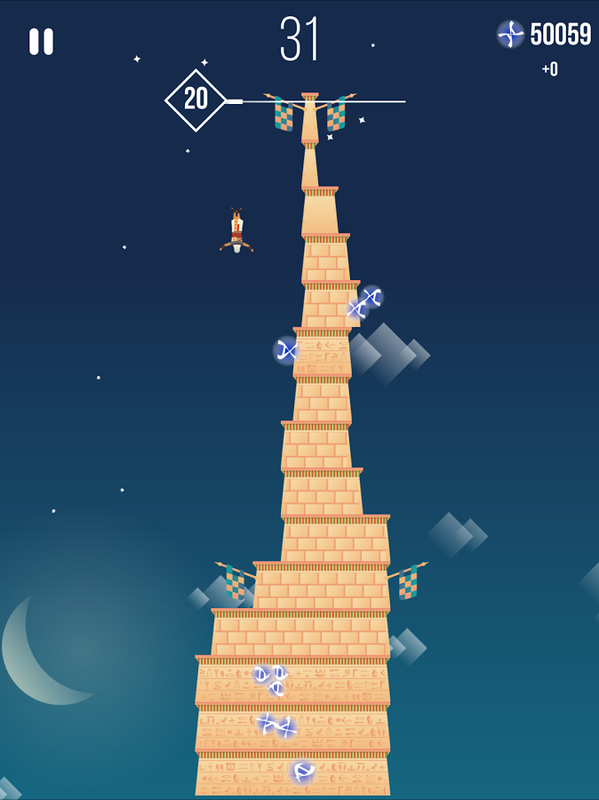 The building mechanic is quite simple and works by tapping on the screen to line up sliding pieces of a tower in order to continue building it higher and higher. Once you can no longer match up the pieces, the tower is finished. This is the point where the original game started over, but here you will take command of an Assassin's Creed character who jumps off of the tower. It is your job to guide this character on their way down to make sure that they land safely in a cart of hay. The trick is you want to collect the game's single Helix currency as you fall. The more Helix you collect, the better, as they can be used for powerups and unlocking new characters. What is nice is that there is no way to purchase these Helix as you can only earn them through gameplay. And while there are advertisements in-between rounds of play, the game's single in-app purchase of $1.99 will quickly remove them. More or less this is a pretty straightforward monetization scheme, which is appreciated. Now when it comes to the gameplay, it works about as well as the original game. That means you will notice a few stutters here and there as the framerate isn't always smooth. This can be troublesome as the game relies on precise taps that can be hindered by an imprecise framerate. While this issue does not make the game unplayable, it is noticeable and apparently has not been addressed by Ketchapp since their original release. Another issue I found is that the gameplay can become boring pretty quick. Building new towers over and over again isn't going to hold anyone's interest for too long. Sure, you have some extended goals like unlocking new levels (which means new towers) or new characters, but the gameplay itself never really changes. So at best this is a casual game to be played sparingly in your downtime instead of something you will sit down and play for hours. 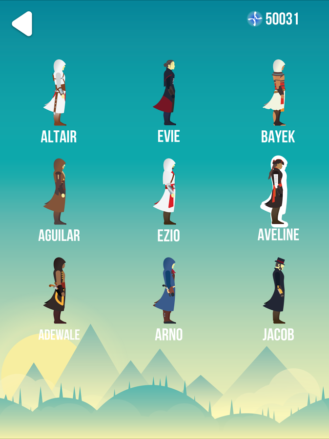 Which is fitting for a mobile game, but probably not what people expect when they see the Assassin's Creed name attached. Luckily Google Play Games Services are supported with the inclusion of a leaderboard and achievement system. These two features should help with the longevity of the game as you can compete with other players or friends for the highest score as well as try to complete the game's many achievements. Sadly there does not look to be any type of cloud saving feature, so you will not be able to pick up where you last left off on a different device. For the most part, I would say The Tower Assassin's Creed is an enjoyable experience, just don't expect anything deep or rewarding. And while the jittery framerate can be an issue, I've yet to find a tower building game that doesn't suffer from this problem, so it's kind of expected. Of course, I would have been a lot more delighted to see this as a completely free release without any advertisements since this is a promotional game for the Assassin's Creed series, but I suppose you can't always get everything for free.